Driveclub - Leaked Footage, Full Car List, and More! It's a battle between long time rivals Microsoft and Sony once again. The racing genre is exploding with fascinating titles making their way towards their corresponding next-gen consoles. Microsoft's Forza Horizon 2 has had some great feedback following its demo on the Xbox One. Sony's Driveclub will certainly have to impress their fan base in order to finish first in this race now that both releases are only a few weeks away. Driveclub developers, Evolution Studio have confirmed downloadable content (DLC) making its way towards the game. Up until June 2015, Evolution will be releasing a mix of free and paid DLC throughout the course of nine months. Evolution Studio has confirmed 11 new tracks with 23 routes to Driveclub for free following its release, this will include a brand new location. Nine cars are expected to release up until June, a total of one car per month. One of the cars that is expected to release will be the will be the 2016 Mercedes-AMG GT. Along with free DLC, paid DLC starts in November and packs will include 38 extra cars in addition to 176 new events. Evolution is also offering the season pass for $25 to have access to all the DLC both free and paid. 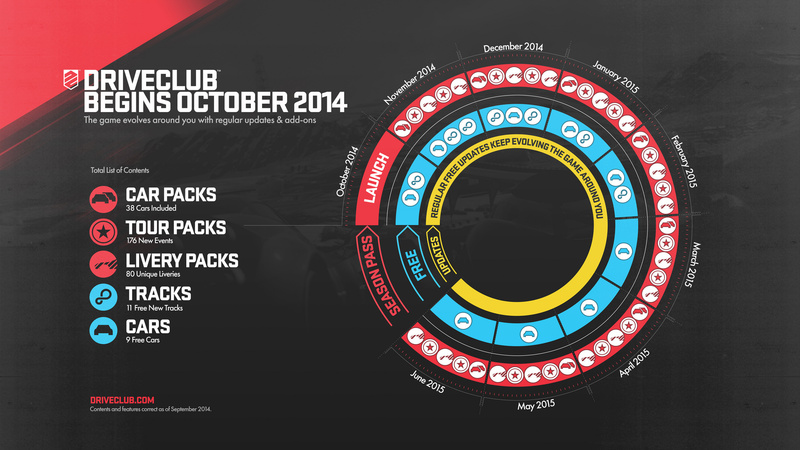 If you plan to get every single DLC available for Driveclub, the season pass is strongly recommended. Buying the packs individually can cost you more than it should be bringing the total to a shocking $75, yikes! The full car list was released today by Driveclub game director Paul Rustchynsky on his official Twitter page. Many people have used the phrase “quality over quantity” to describe Driveclub's list of the 50 cars it has to offer. The car list leaves many people disappointed to find their favorite cars absent from the game. Cars such as the Bugatti Veyron, Nissan GTR, Toyota Supra, and Nissan Skyline will not be making an appearance in the game. Along with the Bugatti and Japanese cars, the entire luxurious Lamborghini lineup is absent along with Chevrolet's Corvette. Many racing fans including myself enjoy a variety of vehicles to choose from, obviously with many cars absent from the final cut, this will not be enough to satisfy me with the cars the game has to offer. In addition to the neat features, PlayStation Plus (PS+) members will be able to test the game before upgrading to the real deal. Both the North American and European version of PS Plus will have access to the demo. The game's description appears as a 14.7GB download, users should be aware that the full download will consist of 17GB for the entire demo. PS+ users will be allowed to download the demo on release date and experience the game at first hand. Players who use this service to play the game have the option to upgrade to the full game with a discounted price of $49.99. This move by Sony is certainly an impressive one that Sony has offered to make their customers satisfied. Sony has also confirmed two brand new bundles exclusive to European users to increase sales with Driveclub and their console. The first bundle includes a limited edition “Glacier White” PlayStation 4 console, the snow-colored system comes with the game as well as an elegant white DualShock PS4 controller. Pricing for the first bundle will come to a total of €439.99. The second bundle comes with Driveclub, a standard black PS4 console, two black DualShock PS4 controllers, and the PlayStation Camera. The cost of the second bundle becomes €499.99 for the additions of the extra controller and the camera. Local retailers in Europe are accepting pre-orders up until the release of the game and will only be available for a limited time. Driveclub will release exclusively on the PS4 for North American users on October 7, October 8 for European and Australian users, and October 10 for the United Kingdom. Tell me Se7ensinners, do you think it was a wise idea to completely erase many of the famous car manufacturers in the car franchise? Will Driveclub dominate Forza Horizon in terms of sales?